New York State Senator, Brad Hoylman. I would like to express my sincere thanks to the Government of the United States of America for inviting me to witness the destruction of more than one ton of confiscated elephant ivory today and I regret that I am unable to make it to New York in person. This is the second public destruction of confiscated elephant ivory in the U.S., following the U.S. Fish and Wildlife Service crush of 6 tons of confiscated ivory in Denver, Colorado, on November 14, 2013. Over the past 24 months we have also seen Belgium, Chad, China, the Republic of Congo, Ethiopia, France, Gabon, Hong Kong SAR China, Kenya, the Philippines, and the United Arab Emirates, all destroy stockpiles of illegally traded elephant ivory that has been seized and confiscated. 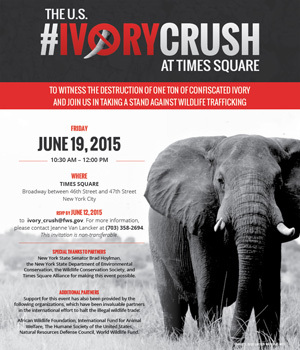 Today’s important event at such a well-known landmark as Times Square in New York serves to raise further national and global awareness about the devastating impacts of illegal trade in elephant ivory and the ongoing determination of the U.S. and the global community to put an end to it. Distinguished guests, the destruction of confiscated elephant ivory in New York today will not in itself put an end to the illegal trade in elephant ivory. It is, however, ensuring that no one will ever profit from this contraband and, when coupled with the seizure of ivory and the prosecution and conviction of offenders, it sends a powerful message that the U.S. does not and will not tolerate this illegal trade. The enhanced collective effort that is underway to combat illegal trade in wildlife – both at international and national level – is a clear evidence that illegal trade in elephant ivory is increasingly being recognized by States as a serious crime, which now carries a much higher risk of detection, prosecution and conviction in a growing number of countries – with tougher penalties, including higher fines, longer prison terms and the confiscation of assets derived from this illegal activity. The U.S. takes strong measures to enforce its laws against illegal trade in wildlife and we are seeing increasing levels of prosecutions and convictions, such as through Operation Crash. Today’s event provides a very public opportunity to warn those people who trade illegally in elephant ivory that the age and origin of their contraband can now be readily identified through the use of modern forensics making prosecution and conviction much more likely. The plenipotentiary conference that adopted CITES back in 1973 was hosted by the U.S. Government and the U.S. was the first State to sign and ratify the Convention. We are most encouraged by the measures being taken by the U.S. to combat this highly destructive illegal trade, which are contained in President Obama’s National Strategy for Combating Wildlife Trafficking (2014) and the related implementation plan. These measures are designed not only to further strengthen U.S. enforcement efforts domestically but also to improve its collaboration with elephant range States, as well as with transit and other destination countries, to stop illegal trade in elephant ivory and other wildlife. These measures include the joint commitments made at meetings of the U.S.-China Strategic and Economic Dialogue in 2013 and 2014 and we note the 7th meeting of the Dialogue will be held next week in Washington, D.C. Distinguished guests, what was recognized at the 16th meeting of the Conference of the Parties to CITES in Bangkok in 2013 is even more relevant today: reversing the disturbing trends in elephant poaching and ivory smuggling requires a sustained and collective international effort that addresses both demand and supply. 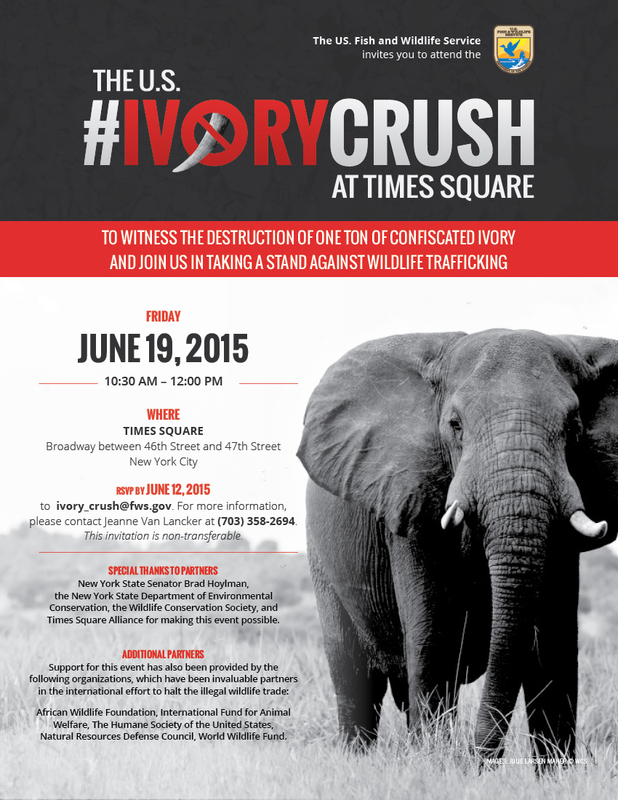 Today’s event will attract global, regional, national and local attention and should serve to raise further public awareness about the devastating impacts of illegal trade in elephant ivory trade and other forms of wildlife trafficking, and about the global community’s collective determination to put an end to it. However, when a country, such as the United States, takes a decision to publicly destroy its confiscated stockpiles of elephant ivory, the Secretary-General regards it as presenting a unique opportunity to draw public attention to the scale, nature and impacts of the serious crimes that lie behind these confiscations and to act as a deterrent to illegal trade.